Siamese Yellowleaf is a tree 5-25 m tall; trunk 15-35 cm d.b.h. ; bark gray, cork thick. Branchlets are slender, yellow woolly, angular. Leaf-stalk is deep yellow-brown, about 1 cm, above grooved. Leaf blade is greenish, shiny, elliptic, lanceshaped or oblong-lanceshaped, 10-24 × 2.5-6.5 cm, leathery, both surfaces hairless, midvein raised below, evident above, lateral veins 6-8 pairs, raised below, distinct above. Leaf base is wedge-shaped, margin sometimes wavy, tip tapering, up to 1.5 cm. 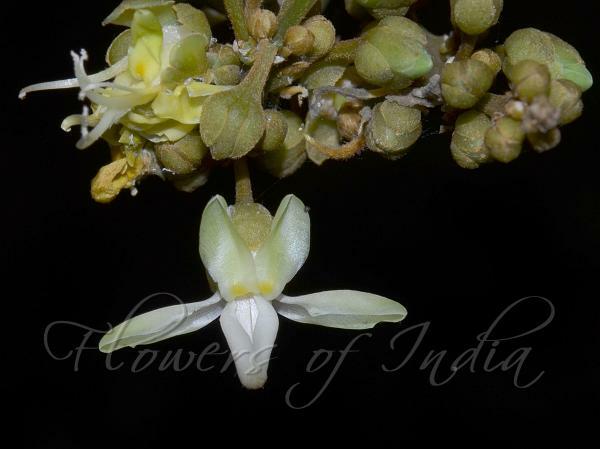 Flowers are borne in racemes or panicles at branch-ends or in leaf-axils, usually much branched, up to 15 cm; at branch-ends branchlets equaling lateral ones, densely yellow woolly. Flower-cluster-stalks is usually compressed, about 9 mm; flower-stalks about 6 mm; bracteoles triangular-subulate, about 1 mm, densely yellow woolly. Flowers are usually nearly opposite and pseudo-whorled. Sepals: outer 2 ovate or elliptic-ovate, about 2.5 × 1.8-2.3 mm, both surfaces woolly, tip tapering; inner 3 obovate-elliptic or elliptic, about 3.5 × 2.3 mm, both surfaces velvet-hairy, fringed with hairs. Petals are white, 6-7 mm, keel below pilose. Stamens are 8, 5-7 mm. Ovary nearly spherical, about 1.5 mm in diameter. Drupe is green when young, about 1.8 cm in diameter, hairless; fruit stalk 0.5-1 mm. 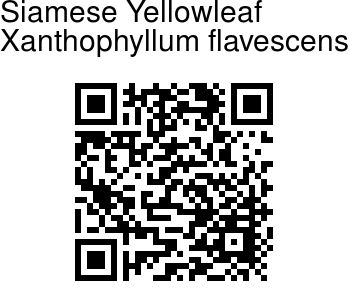 Siamese Yellowleaf is found in India, Sri Lanka, Myanmar, Thailand, Malaysia, Indonesia, Cambodia, Laos, Vietnam, Philippines. Flowering: March-April. Identification credit: Anurag Sharma Photographed in Kerala.